Lowcountry Local First (LLF) is celebrating a decade of loving the Lowcountry in 2017. In February of 2007, we became the first (and still only) organization to act as a unified voice, breaking down barriers for local-independent businesses across the Lowcountry. Jamee Haley, Matt Bauer, Andy Gowder, and others launched LLF as a grassroots movement with forty local businesses pioneering together around the belief that they were “better together.” Today, we have more than 500 local business members of all sizes and across dozens of sectors. We are celebrating our 10-year anniversary by showing love for the businesses that make the Lowcountry a unique and vibrant place to call home. How exactly? – The Mayors of the City of Charleston, North Charleston and the Town of Mount Pleasant publicly declared February as “Love a Local Month.” Read their declarations here. – On February 14, a highly visible public art installation launched and will remain up through March 31, encouraging conversation and awareness of the value community-based businesses bring to our quality of life. 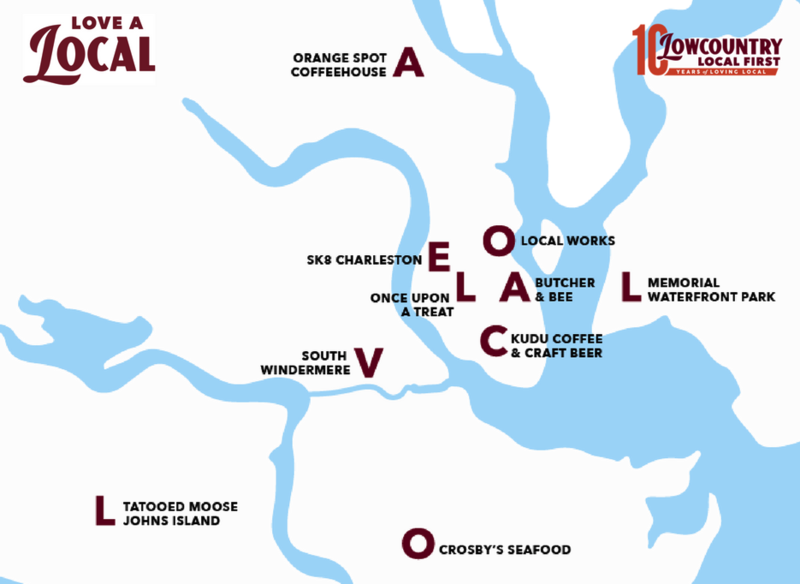 Large, individual 3D format letters spelling “Love a Local” are spread across the community, including Johns Island, West Ashley, James Island, downtown Charleston, North Charleston, and Mount Pleasant. View a map of all locations. As you pass by these “Love Letters,” we invite you to share and tag photos of the letters and use #LoveALocal to share which local businesses you love and why. An interactive letter (“C”) located in the courtyard of Kudu Coffee will allow you to write and leave a love note to a local business. We will regularly gather these notes from the mailboxes provided and share them with the businesses. Lowcountry Local First will continue to invite public participation in this campaign throughout the year. Continue to follow our e-newsletters, social media and event announcements to learn more.